The US Army plans to cut 40,000 soldiers from its ranks over the next two years to save money at home and abroad, a US defence official said on Tuesday. 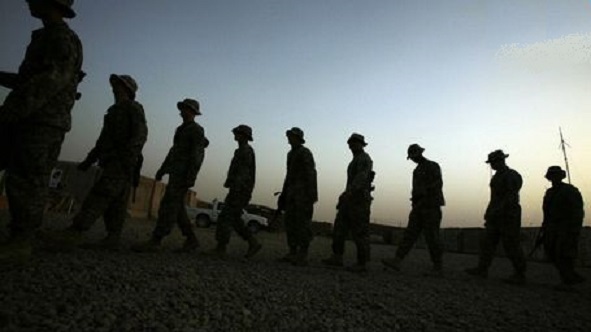 An estimated 17,000 civilians working for the Army will also be laid off. USA Today quoted a document it had obtained and said the cuts are being made to save money. The defence official said the Army plans to announce the cuts soon. USA Today said it would be this week. The cutbacks will affect virtually every Army post at home and abroad. Under the plan the Army will have 450,000 soldiers at the end of the 2017 budget year, down from 490,000, its smallest number since before the United States entered World War Two. It added that in 2013 the Army argued in budgetary documents that going below 450,000 troops might mean it could not win a war. By comparison, the Army swelled to 570,000 men and women during the peak of fighting in Iraq and Afghanistan, the paper said. Across-the-board government budget cuts are due to kick in in October and if Congress does not avert these the Army will have to lay off another 30,000 soldiers on top of the 40,000, according to the document quoted by USA Today. The troop reductions were initially announced in February 2014 when then-Defence Secretary Chuck Hagel unveiled the Pentagon’s budget for the 2015 fiscal year. The figures were also included in the Pentagon’s four-year planning document, the Quadrennial Defense Review 2014. Defense officials confirmed on Tuesday the Army was moving ahead with the plan to reduce uniformed and civilian personnel and was expected to announce details on Thursday about which units would be affected by the cuts. The personnel cuts come as the Pentagon is attempting to absorb nearly $1 trillion in reductions to planned defense spending over a decade. This entry was posted in America, United States and tagged Army, government budget cuts, Jobless, Jobs, The Army, US Forces, US Marines, Veterans. Bookmark the permalink.